The qualifications are in accordance with the UGC regulations 2010 and their subsequent amendments as adopted by the University of Delhi I. Good academic record as defined by the concerned university with at least 55% marks (or an equivalent grade in a point scale wherever grading system is followed) at the Master’s degree level in a relevant subject from an Indian University, or an equivalent degree from an accredited foreign University. II. Besides fulfilling the above qualifications, the Candidates must have cleared the National Eligibility Test (NET) conducted by the UGC/CSIR. 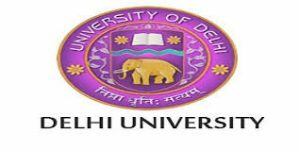 For Delhi University Admission 2017 candidate should check the age details from the official notification. Candidate who belongs to General & OBC category should pay Rs. 500/- for DU Faculty Recruitment 2017 – 18. Those who belongs to SC/ ST/ PWD and Women candidate should no need to pay any application fee for Delhi University Recruitment 2017. The fee once paid will not be refundable. Those candidate who are going to take part in Delhi University Admission 2017 will be paid Rs. 15,600/- to Rs. 39,100/- with grade pay of Rs. 6,000/- per month after the selection. Eligible candidates can apply online through the website www.du.ac.in on or before 24-06-2017 or within 02 weeks from the date of advertisement. 1. Candidates should log on to the website www.du.ac.in. 3. Read the Notification & Click on online link. 4. Enter Login Details if candidates have already registered. 5. Complete the New Registration if new Candidate. 7. Take printout of application for future use.